A new coat of paint can do wonders for a dull, drab room. But sometimes you want to go a step further. Applying a knockdown texture to the wallboard before painting can help deaden sound, hide any imperfections in the drywall and, more important, provide a warm and rustic feel to the room, similar to Spanish-style stucco. Curtis Burks is the professional contractor overseeing the painting of the house – the second home he’s painted for Jerry. “It’s a fairly simple process,” says Curtis, regarding the application of the texture. “If a homeowner has the right tools and knows the basic steps, it’s something they can easily do themselves.” Curtis was kind enough to let me snap some photos for EHT as he illustrates the process of applying the knockdown to Jerry’s basement walls. 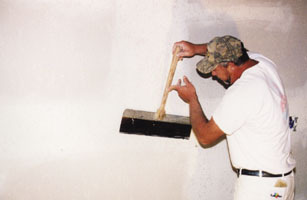 The basics of a knockdown finish involve sheetrock joint compound sprayed in dollops over the surface of the wall, allowed to set briefly, and then lightly troweled to “knock down” the tops of the dollops, forming a rough, earthy, uneven finished surface. This will be a messy job, so if you’re in a furnished room, then ready the drop cloths. First step is to thin the compound with water to the consistency of thick pancake batter. “You don’t want the compound too thick, or the nozzle won’t operate right,” notes Curtis. 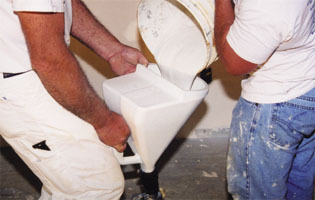 “It needs to be thin enough to leave the nozzle easily and spread evenly over the wall.” Your best bet is to test the spray pattern on scrap material or a closet wall until you’ve adjusted the mud mix to the consistency you want. Different nozzles and adjustable tips also enable you to use a variety of spray techniques. Adjusting the air pressure may also help fine-tune the spray. Spray on the compound, moving over the wall in even strokes to cover the surface from top to bottom in a fairly consistent amount of splatter. The largest “blobs” of mud used in the application pictured here are about the size of dimes or pennies. After the compound sets for 15 to 30 minutes the sprayed mud will become tacky. Drying time depends on air temperature, humidity, mix consistency, etc. When the mud is tacky, but not dry, hold the trowel at an extremely shallow, flat angle and work it in vertical strokes from top to bottom, bottom to top, over the dollops of compound. The object is not to smear or displace the dollops, but to remove the peaks. The vertical motion of the trowel pulls the mud upward and downward, achieving the rough, textured finish. Once the entire wall has been troweled, the texturing phase is complete. Any small missed spots or repairs can be treated by simply dipping a paint brush into the thinned compound and “flicking” the mud onto the wall, simulating splatter from the spray gun. Just allow the patch to cure and trowel as usual. Allow the compound to dry completely – at least 24 hours. Opening windows or using a box fan will assist the drying process. 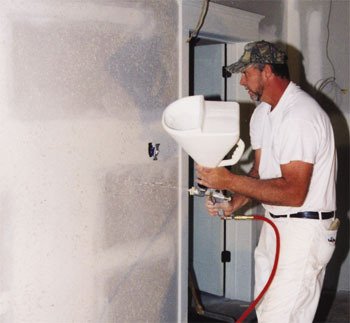 Once the mud is dry, simply prime and paint the textured surface the way you would new drywall. The resulting knockdown finish is a cost-efficient method to give new or old walls a handsome stucco-like appearance that adds character to any room. Sheetrock surface after the initial spray phase. Sheetrock surface after finishing with a trowel. Editor’s Note: Special Thanks to Curtis Burks Painting for help with this article. “The proper product for such an application is called ‘Super White texture compond.’ Granted it’s twice as expensive as drywall mud but it’s made for the application. 1) Finish the wall or ceiling as normal ( taping with Sheetrock 90 then normal mud for next 2-3 coats, then sanding ready for paint ). 2) Coat the wall or ceiling with 2 coats high-quality primer/sealer (add 6 drops black tint per 5 gallons white primer….If you want a particular colour you can tint the texture accordingly before spraying). 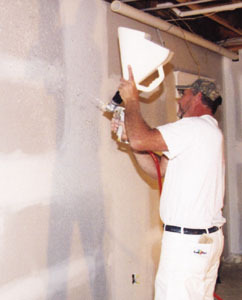 3) Spray the wall or ceiling with a good quality texture sprayer using “Super White texture compound,” do a 1/3 trigger pull then full trigger pull for each section. This method gives a nice VERY FINE SPIDERWEB underlayment with the regular sized knockdown in the foreground (very classy look). 5) You are now completed, DO NOT PAINT finished textured surface, it’s done. If you mixed the 6 drops black tint into the 5 gallons primer you will now have a very subtle contrast between your wall/ceiling surface and the newly applied texture, this gives a better 3-dimensional look and adds more character. If at some point down the road you need to remove the texture (wallpaper wanted) it will scrap off easily by pre-soaking with water, if you HAD PAINTED the texture you would have one heck of a time scraping. PS. — Using cheap drywall compound (mud) for texture promotes mildew growth, whereas “Super White” or a similar product will not. This is the reason many professionals use Sheetrock 90 as the first tape coat, as Sheetrock 90 also does not promote mildew growth.